A blend of six synergistic, all-natural ingredients that deliver a powerful array of nutrients for your health and longevity. 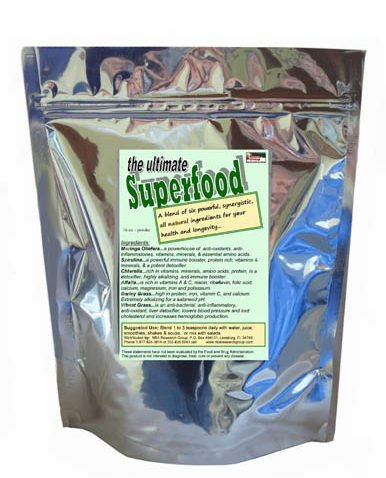 Ultimate Superfood nourishes the cells of the body, which results in better digestion & assimilation, increased immunity, improved circulation, more energy, and many more physical benefits. Moringa Oleifera...a powerhouse of anti-oxidants, anti-inflammatories, vitamins, minerals, & essential amino acids. Spirulina…a powerful immune booster, protein rich, vitamins & minerals, & a potent detoxifier. Chlorella…rich in vitamins, minerals, amino acids, protein, is a detoxifier, highly alkalizing, and immune booster. Alfalfa…is rich in vitamins A & C, niacin, riboflavin, folic acid, calcium, magnesium, iron and potassium. Barley Grass...high in protein, iron, vitamin C, and calcium. Extremely alkalizing for a balanced pH. Wheat Grass...is an anti-bacterial, anti-inflammatory, anti-oxidant, liver detoxifier, lowers blood pressure and bad cholesterol and increases hemoglobin production. NBA Research Group is prohibited by law from making any claims that our products are suitable or effective in treating, curing, or preventing any disease or condition. We do not make these types of medical claims on any product , nor do we guarantee that they will work for any disease or condition. Information stated on this web site should not be considered as medical. Only a licensed medical doctor can legally offer medical advice in the United States.